Halal certification enables up to $13bn in food exports each year, according to Australia’s peak body for food and drink manufacturers, which has criticised the “abusive anti-halal calls and mail” directed at its members by opponents of the certification scheme. The Australian Food and Grocery Council (AFGC) also questioned claims that halal certification represents a “tax” on business, arguing the religious approval “creates more value than it costs”, in a submission to a Senate inquiry on third-party food certification. 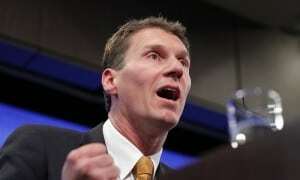 More than 700 submissions have been made to the inquiry, which was initiated by South Australian senator Cory Bernardi in May to “get to the bottom” of the halal industry, which he has previously described as a “racket”. Among the concerns raised in the submissions is that halal certification is “forced on” retailers; funds terrorism; and is “purely a scam of gigantic proportions”. But the AFGC has defended the industry, arguing that companies pay halal certification fees because “the net effect [is] beneficial”. “Put somewhat bluntly, manufacturers will only pay a dollar for a certification if they expect to get more than a dollar back in sales, whether directly or indirectly,” the AFGC said. A survey of AFGC members found “no single type of certification stands out as being especially costly or hard to obtain”, according to the submission. It noted that staff at some member companies had been subject to “abusive anti-halal calls and mail” by critics of the Islamic certification. “Such behaviour should neither be encouraged nor condoned by this inquiry,” the AFGC said. All certifiers, halal and otherwise, could provide more transparency of their processes, it noted, including of whether “the certification scheme is run not-for-profit or as a commercial venture”. The AFGC also called on Australian trade negotiators to press foreign markets to streamline their halal requirements, noting some beef exporters were having to obtain multiple halal certifications in Australia to meet different countries’ requirements. For example, Australia’s largest meat exporter, JBS Australia, spent $2.4m last year obtaining different religious approvals (but generated $3.3b in revenue). Anti-halal sentiment briefly became prominent last year and is frequently raised by some far-right and Christian parties. A prominent anti-halal campaigner, Kirralie Smith, and the “Islam-critical” Q Society are being sued for defamation in New South Wales over their claims the Islamic certification industry is corrupt and funds “the push for Sharia law in Australia”. The Australian Crime Commission, which last year completed an investigation into money laundering in Australia, has said it is “not aware of any direct links” between the industry and violent extremist groups. The federal agriculture minister, Barnaby Joyce, has warned his colleagues against “picking a fight that we never needed to have” over halal, because of the potential impact on Australian exporters. “Unless it’s halal certified, we can’t sell it. That means the whole processing line becomes unviable,” Joyce, the deputy leader of the Nationals, said in April. Tony Abbott has also defended the industry, arguing it is “just part of exporting to the Middle East, and if we want our exports to grow all the time, this is what we need to do, and I think that’s what Australians want”.